Bruce once again returns into the darkness of his soul. The city is wet as the rain pours. 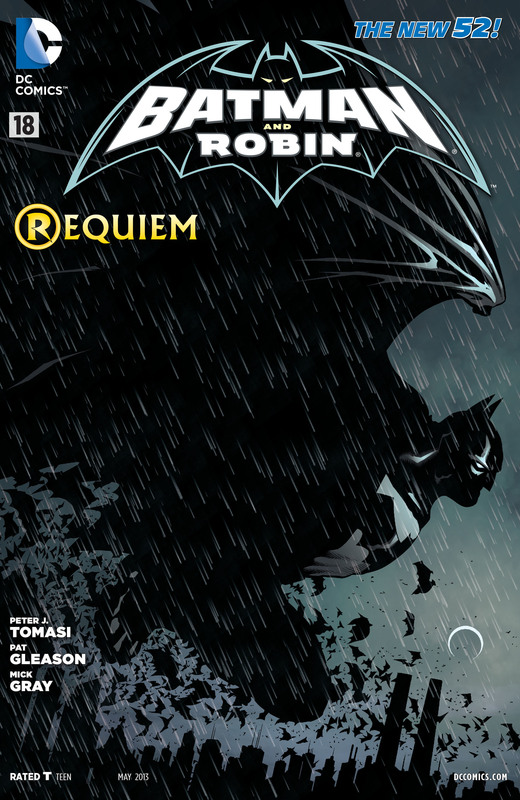 The skyline is just visible in the background of this cover, as the rain and bats move across it. Half of this page is just blackness with droplets of rain. Somewhere amongst this erratic force of animals and environment, flies Bruce Wayne. His silhouette is visible with the corners of his cape and mask reflecting the minute moonlight. The Bat symbol on his chest is only just visible. These are just semblances of the man under the cowl, because only semblances of the man remain. He is broken because he has lost his flesh and blood. His safe place is alone and moving in the nights of Gotham City. It was his salvation when he lost his parents, and will hopefully be the same now he has lost his son. Patrick Gleason captures the emotion of the story better than most artists. This comic itself is a silent movie of emotional devastation and this cover is where it begins. It is dark, it is wet, it is bleak and it is Bruce Wayne. I also love how this image is repeated on the inside, this time with Damian side by side with his father as he imagines how it used to be when his son was still alive.